The FAQ herein provides responses to questions that come up in relation to the training and certification courses offered by eXampleCG. 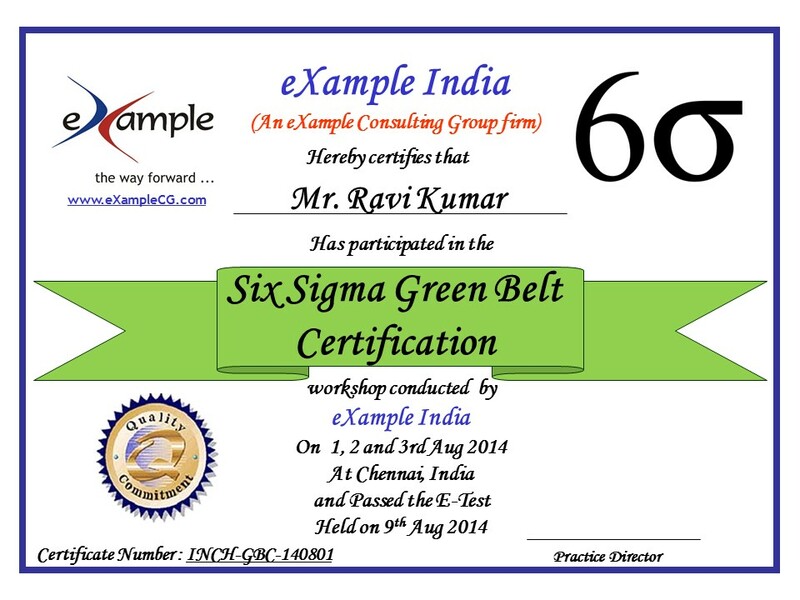 While we refer to Six Sigma as an illustration, the responses are equally applicable to our Balanced Scorecard, Six Sigma Green Belt, Lean Six Sigma Black Belt, Leadership Development and Predictive Analytics certification courses. The course fee charged for our public workshops does not include "Practitioner" certification fees. Practitioner certification fees is to be paid only when the participant is ready to submit a live project for assessment / evaluation, along with an online application. Practitioner certification fee is currently fixed at INR 4,500 per project assessment. DOES IT INCLUDE EXAM / TEST? IS IT ONLINE (OR) OFFLINE EXAM? It is an online exam. The link / URL will be e-mailed to the participant one day prior. You require a browser and internet connection to access the exam. The exam is normally conducted on the immediate weekend (Sunday) after conclusion of the training program. If the course concludes between Monday to Thursday, the exam is conducted the immediate following Sunday. If the course concludes on Friday or later, the exam is conducted the next weekend Sunday. HOW MANY HOURS, HOW MANY QUESTIONS? To help you get ready for the final exam, you will be given access to TWO Mock (practice) exams. The E-mail links will be sent to you to get familiar with the user navigation and types of questions expected in the final exam. On completing the Mock exam, the obtained score and incorrect answers are displayed to help calibrate your performance. WHAT IS THE PASS %? is the exam fee included in the course fees? Project is mandatory to reach "Practitioner Certification". eXampleCG strongly recommends and encourages participants to undertake a live business project after completing the course to realize the full benefit of learning the subject. We provide 100% FREE post project guidance and mentoring to help you successfully take up and execute a project. do i have to get a project (or) will i be given a project? Projects are to be initiated by the participant in their respective organization or company. eXampleCG does not allot projects as it is not practically feasible due to the diverse nature of participants who attend our courses from different industries, functions and grades of experience. During the training course, the participants can discuss project opportunity areas with the trainer and identify right ones to initiate a project, once they get back to work. We provide 100% FREE project mentoring and guidance, at no extra cost. how soon should i complete the project? eXampleCG provides a 24 month (2 years) time frame within which the participant can undertake and complete a project and submit to us for evaluation / assessment. All our programs are 100% designed, developed, delivered, assessed and certified by eXampleCG. The certifying body for courses conducted in various countries is displayed below. IS THE CERTIFICATION BODY GLOBALLY RECOGNIZED? Six Sigma courses DO NOT have any Single national or international certifying or accrediting body. Six Sigma methodology was originated by Motorola in the 1980s and spread to many organizations as a way to build excellence in business operations. Organizations like ASQ or IASSC operate with their own Six Sigma curriculum, assessment and testing process. Often we find many such certifications (both the curriculum, coaching and assessment) is much theoretical with very low emphasis on building practical hands-on application (with live projects) oriented knowledge or expertise. Of late, accreditation has become a huge "money making" exercise with providers of any type getting "accredited" by paying the fees to the accrediting organizations and running courses with minimal worth or value. Looking at it from an employer's point of view, they seek professionals who can contribute to improve business performance by "application" of Six Sigma methods through live business projects. Companies are definitely not interested in a person who has just a "certificate" from a XYZ accrediting body without practical application experience or live project showcase. Our courses are designed to be completely hands-on and application oriented with three progressive levels to help you move forward in a milestone manner. Our training courses have 80% practice and 20% lecture. After you complete the training and pass the exam, we provide 100% FREE post program guidance to enable you successfully undertake a live project in your company and reach "Practitioner" certification. Professionals looking to add value to yourself, your employer and business by application of Six Sigma (or our other certification courses) are invited to join our practical and hands-on training workshops. If you are just looking for a certificate with "theoretical" skills, then you may get trained with any provider!! CAN YOU SHARE A SAMPLE CERTIFICATE? The sample certificate for our various courses and milestone levels is displayed here. what is live online classroom? eXampleCG regularly conducts classroom sessions of our courses at Bangalore, Chennai and Mumbai, India. We received requests from many participants across India and from international locations to join our high quality workshops, but cannot make it due to logistics, travel and stay expenses. To provide them an opportunity to learn from their own location (home or office) wherever they are globally, we launched Live Online Classroom mode of delivery. how does live online classroom work? Essentially it is a hybrid model. Let's say our trainer conducts the (physical) classroom training at a venue in Bangalore. Participant(s) who registered to join via Live Online Class are emailed a Virtual Classroom Link / URL with instructions, a day prior along with a link to download the Course Materials to their desktop or laptop. During the class, the trainer shares his computer screen which is visible to the remote participant. 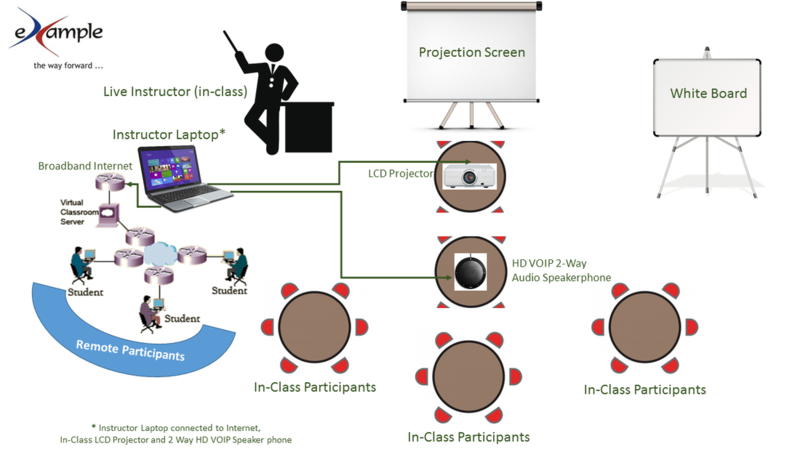 The trainer also connects his laptop to a HD VOIP Audio Speaker phone set up in the middle of the (physical) classroom for two way audio conferencing. No telephone numbers or pass codes required. This enables remote participant(s) to listen to the trainer's voice and that of the (physical) class participants. how is it different from e-learning (or) self e-learning? This is a very unique and innovative model as it enables remote participants to get the benefit of learning from a LIVE EXPERT trainer in a group learning setting through enriching discussions and interactions. who can join live online classroom program? what computer system do in need to have to join live online class? You will require a modern laptop or desktop system (Windows 7 or above) with 2 GB RAM and 200 GB HDD + Headset (Mike and Speaker built in) + Steady Internet Connectivity (512 KBPS or more). Participants who do not have this configuration will NOT be permitted to attend the Online class, as it tends to disturb the entire class on account of technical inadequacy issues. can i join the class via tablet device - android (or) ipad? can i join the class via mobile - android (or) iphone? It is feasible to join from a mobile phone, however the screen size to view the contents shared by trainer may be too small for your comfort, besides it is difficult to perform individual and group exercise activities via mobile, hence attending the course via mobile phone is NOT recommended. The FAQ above provides responses to questions that come up in relation to the training and certification courses offered by eXampleCG. While we refer to Six Sigma as an illustration, the responses are equally applicable to our Balanced Scorecard, Six Sigma Green Belt, Lean Six Sigma Black Belt and Predictive Analytics certification courses. If you have queries not addressed herein, please click Feedback (see side bar) or visit Contacts page to post a request.